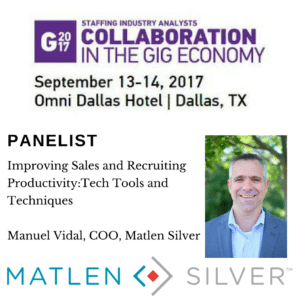 Manuel Vidal, Matlen Silver COO, will be a featured panelist at the Staffing Industry Analysts (SIA) Collaboration in the Gig Economy conference, to be held at the Omni Hotel in Dallas, September 13-14, 2017. Vidal will be sitting on the Improving Sales and Recruiting Productivity: Technology Tools panel. The Collaboration in the Gig Economy conference will follow the CWS Summit which will be held on September 12-13, 2017. These conferences are the largest North American peer-to-peer networking events for contingent workforce professionals. They provide the opportunity for all players in the talent supply chain to problem solve together and gain impactful strategies on how to maximize the value in their own programs. Manuel Vidal is a dynamic COO who has worked in the IT staffing industry for over 20 years. After starting his career as a recruiter in the staffing industry, Vidal rapidly rose through the organization and held positions as a Sales Executive, then Sales Lead, before stepping into the COO role in 2012. Under his leadership, Matlen Silver’s revenue has tripled in five years. As a member of the panel that will present on September 14th at 3:15, Mr. Vidal will be illustrating how Matlen Silver is revolutionizing the way that they communicate with their clients and consultants. By using a new and innovative engagement platform that provides a high touch level of service for both clients and consultants, Matlen Silver has increased consultant retention, improved redeployment time of consultants to minimize the lag time for both the client and the consultant and increased overall consultant and client satisfaction with Matlen Silver’s service. The CWS Summit and Collaboration in the Gig Economy conferences will be held September 11-14, 2017 at the Omni Hotel in Dallas, TX. For more information, visit Collaboration in the Gig Economy. Christina Vinson is the Director of Marketing at Matlen Silver.